There are many symptoms of leukemia some of which include repeated infections, anemia and bruising and bleeding. If you notice any of these symptoms in you or a loved one, you should err on the side of caution and see your medical professional. Leukemia is a cancer of the blood. It mostly develops in the bone marrow, which is the soft inside part of your bones. Hematopoietic stem cells are found in the bone marrow. Most often a bone marrow transplant or bone marrow stem cells transplant is done to help cure this horrific disease. Along with hematopoietic stem cells therapy, usually the patient will receive chemotherapy as well. The chemotherapy will help to kill the cancerous cells while the bone marrow transplant will help to regenerate new healthy cell, thus sending the patient into remission. Over the past few years, there has been a huge controversy about stem cell research. Mostly this is because of pluripotent stem cells. These are stem cells taken from an implanted embryo. 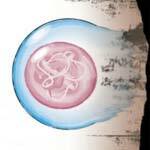 In the past it was deemed necessary to destroy the embryo. This is not true, most times no damage is done to the embryo. Leukemia is not the only reason for studying stem cells. Another is the possibility of curing cerebral palsy. There have been some cases where a cerebral palsy stem cell transplant has apparently cured cerebral palsy. Every day, we are one step further to so many cures of horrible diseases. This is all thanks to hematopoietic stem cells research.